« The Clock Is Ticking: How Long Until Romney Retreats? This entry was posted on Saturday, April 28th, 2012 at 15:46 and is filed under Capitalism, Conservatism, Culture, Education, Mark Levin, News, Politics. 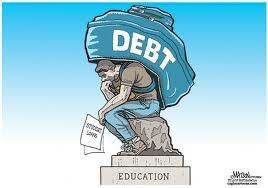 College…education…this day and time? Oxy…moron…breathing…idiot. Sign on for that and get meaningless degree…one should have to pay the rest of one’s life! Meaningless degree…is any degree that adds nothing to increased production and betterment of life for self, family and those others in your realm. As for world…lots of realms have to overlap. Even the Russian Constitution said “from each according to his ability, to each according to his need, but if you don’t work…you don’t eat.” Look it up. Occupy don’t count. There are degrees worth it, but you don’t “occupy” to get them. Even now there are jobs if one chooses a field with a need.